Logika is a modern 4PL company in Greece that is active in the fields of international transport, inventory management, customs services, collection and/or delivery of goods within Greece and consulting. The main objective of the company is to cover services of the entire supply chain. Its aim is to ensure a smooth flow across the spectrum of the supply chain, saving time and cost. Our consultants are able to identify your company’s needs throughout the supply chain and can suggest a course of action that will help you meet your objectives and support your products and your customers. Logika has three (3) logistics centers in Athens. At its premises (total warehouse area of 20000 m2), Logika undertakes the handling, storage, collection and distribution of both free and bonded goods. The first logistics center is a 12000 m2 Type A customs warehouse at Magoula, which can accept general cargo and non-refrigerated food stuff. 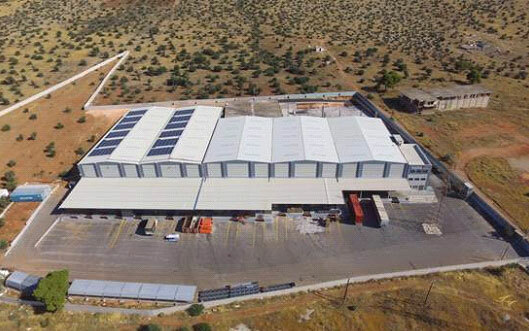 The second logistics center (4000m2) at Magoula provides logistic services for packaging and electronic materials. The third and recently created logistics center (4000m2) at Aspropyrgos can accept non bonded general cargo. Logika is also active in international import and export transports to and from Europe and Third Countries, offering the best possible service for whole or partial loads. Logika also offers to its customers a variety of specialized transport services (Fragile & Valuable equipment, Hi-Tech Equipment, Over-sized shipments, direct or cross trade shipments, fashion and clothing items, Ship spares as well as liquid bulk shipments in Flexi Tanks and Tank containers). Regarding road freight, Logika is active in transports to and from European countries and Turkey. The road freight department can handle shipments from a single pallet up to a full truck load, ensuring the timely and safe transport of the consignments. It offers transport solutions tailored to customers’ needs and requirements. Logika, because of its ideal location, is acting as a distribution center for exports in transit to all European locations under T1 status. Regarding custom clearance services, Logika, through its team of experienced customs agents, handles at highly competitive rates custom formalities and customs clearance of import and export shipments, exports in transit and/or free circulation and issuance of all requested custom documents. It also offers consultancy on customs and commercial procedures. Logika’s workforce is a mixture of experienced professionals and of highly qualified trainees in order to meet the company’s objectives through the provision of high quality services and to ensure its continuous development. The workforce consists of specialized logistics coordinators with an extensive experience in warehousing, storage, distribution and transport. Logika is ISO 9001:2008 and ISO 22000:2005 certified for its quality management system and its food safety principles in the field of supply chain services. It is also SQAS certified and named as an Authorized Economic Operator (AEOF) for Customs Simplifications / Security & Safety. The AEOF certification ensures Customs Compliance, Financial solvency, Appropriate bookkeeping standards, Appropriate security & protection standards. Logika is recognized as a reliable service provider. It is focused on sustainable growth and increased competitiveness by providing service excellence and strives for continuous improvement through innovative solutions and integrated infrastructure. It’s vision is to develop further while maintaining its leading position in the market and to offer the best possible customer experience.